All the money right now is on Apple releasing an iPad mini 2 with a faster processor and a Retina display this October, but new code pokes pixel-sized holes in this speculation. Developers have reportedly uncovered a hidden iOS 7 SDK file that references code names thought to be for the new 7.9-inch tablet, according to 9to5Mac. The problem is that this code lacks the necessary "@2x" mode hooks used by developers to indicate Apple's "better than HD" display, as is the case for the iPhone 5 and iPad 4. Instead, the iOS 7 beta file is said to contain references to non-Retina images "@1x" for this particular model of the iPad mini 2. More than one iPad mini 2? 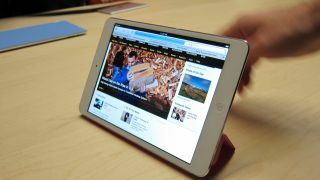 An iPad mini 2 with a Retina display isn't ruled out by the report. The three models referenced by the iOS 7 beta file go by the code names J75, J76, and J77, hinting at one Wi-Fi-only model and two cellular-based variants. There has also been speculation that a separate J85 exists as the code name of the iPad mini 2 with a Retina display. The more unlikely scenario is that Apple is merely testing out non-Retina iPad mini 2 tablets internally and happened to leave the code inside the iOS 7 beta. The good news is that the new iPad mini trio will have an Apple A6 processor, according to the same hidden file that references a "s5l8950x" System-on-a-Chip. That's an upgrade over the A5 processor found in the current iPad mini and matches the one found in its bigger brother, the iPad 4. The iPad 5 is said to debut the A7 processor, but these specs aren't likely to be confirmed until Apple officially unveils its new tablets. Any bets on when that will happen?